Birth stories are difficult to write and especially to share. They ask one to put into words something that is so sacred, so deeply intimate, so vulnerable, so inexpressible, that it is hard to feel as though it is ever adequately articulated. Sometimes I wonder if it is even something that should be shared but I have decided I will try. Birth is anything but easy and reading others’ birth stories has been invaluable to me as a birthing woman and I hope I can serve others in this way. It's weird to put myself out there like this, but in doing so, I hope I can do my little bit to help someone else. My other intention is to give to the little boy I love his opening story. The boy we named Luke Emmanuel. And yes, it's long so get comfortable. I wanted to be prepared to give birth by December 8 since that was the day I was 38+6 weeks, the day I gave birth to Michael. The others were at 39 weeks and 39+1. I also thought the Solemnity of the Immaculate Conception would make a great birthday for our little one. I was definitely hoping to give birth that day or in the next few days. December 9 would also have been neat since both Michael and David were born on the 9th day of their month. I know, it probably sounds silly to most people but I’m big on having a cool birthday. If it can’t be a really neat feast day, then I at least hope that it’s a good number or has some significance. It ended up that God’s plan for our little man was a little later than I was thinking. It wasn’t until the very early morning of December 13th that his birth began. I had had a restless night sleep and was just expecting labor to begin. I was impatient. The 13th did happen to be one of the other days that I had in mind to birth, as it is the feast of St. Lucy and would have been our name choice for a daughter. So I laid in bed tossing and turning with the insomnia I struggled with all through pregnancy, this time coupled with anticipation any time I felt one of the light Braxton-hicks contractions that had been occurring during the night. By 1 a.m. I was still unable to get into any real sleep and laid there waiting to see if anything would happen. When 2 a.m. rolled in and I was still tossing, I decided to see if I could get any of these contractions to begin labor. They weren’t very frequent but I was anxious and couldn’t sleep anyway. 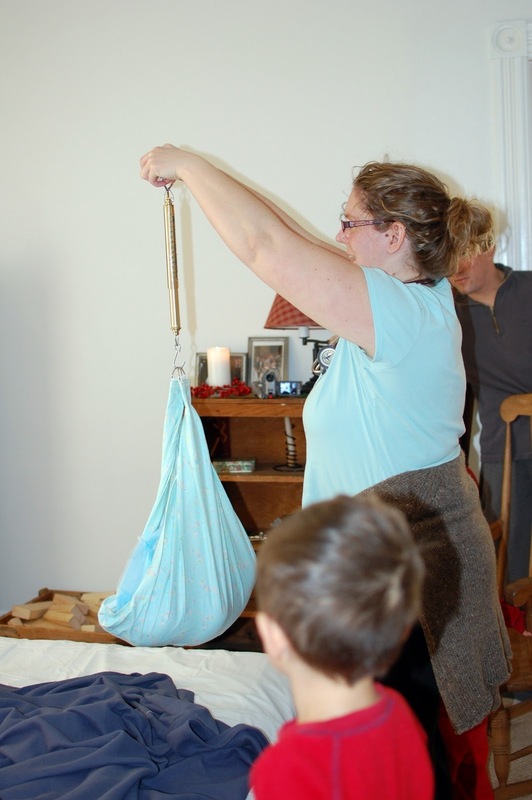 During some of the contractions I began to get out of bed and squat to help baby descend. At some point, something did click and the contractions continued and grew in intensity. Brian woke up at about 2:30 to see me squatting and moving around and I told him I wasn’t yet sure but that things might be starting. In just a short while it became clear from the growing intensity of the contractions that things were happening and that it was time. We made our way as quietly as possible downstairs so as not to wake the boys and began preparing for the birth. I had another Labor List for Brian, per his request, so he would know what needed to be done and in what order. After turning on the upstairs bathroom fan to help with muffling the noise so that the boys would sleep, he got to work setting up the pool while I pulled out the sofa bed and got it made. A few of the other things on the list were starting a pot of water to boil for our midwife, turning the heat way up, lighting candles, laying out the towels, and putting on music. I changed into a tank top with my pajama pants. While all of this was still going on, the contractions were getting stronger and I was working through them. Brian called Khristeena, our midwife, and told her it was time and then called our friend Lori, who would be helping Khristeena as an assistant and also taking pictures for us. After everything was set up the way I had pictured, it seemed surreal. We had just set up our Christmas decorations the day before and since it was now the feast of St. Lucy, we turned on the window candles and the outside Christmas lights. It was so cozy despite the lack of snow for which I had been hoping. I asked Brian if we could pray a Rosary while we waited for Khristeena to arrive and as labor continued to move forward. We had prayed a Rosary while I was laboring with David and it was such an awesome, powerful experience. So we prayed. We made it through all the Joyful Mysteries and just as we finished, Khristeena pulled in the driveway. At this point I think it was about 3:45 or 4:00 a.m. She made her way quietly inside and began to set up her equipment and get ready. Through all of this, contractions were getting more and more powerful. I was finding that leaning on the rocking chair faced towards me with my arms on its arms and squatting during the surge was the position that I wanted to be in most. I would start out standing and as the contraction peaked I would find myself squatting in front of the chair using small back and forth rocking to help me cope. The labor was getting very intense at this point and I could feel myself very much wanting to hurry things along and get this birth thing over with. There is a belief that a mother, especially after a natural birth, immediately forgets the pain of birth once it is over. While I had an amazing experience with each birth, during this pregnancy I could definitely remember how grueling the work of birth is and I was nervous. For as much as I can appreciate the power and sacredness and awesomeness of birth, I still wasn’t necessarily ‘wanting’ to do it again. I could remember how painful it was and how agonizing that second stage is and it was hard to psyche myself up to go through it again…but there really is no way out but through it. So, with this birth I was trying to will it to go faster. The contractions were still spaced out a bit and one great element of this birth was that in between I felt fine. Tired from lack of sleep, but overall I was in good spirits and joking with Brian and Khristeena. Khristeena remembered that I wanted the baby’s heartbeat checked a bit more with this birth so every 15 or 20 minutes, she would check the heartrate with the Doppler and it was great every time. I could still feel the little one kicking around which was also very comforting. 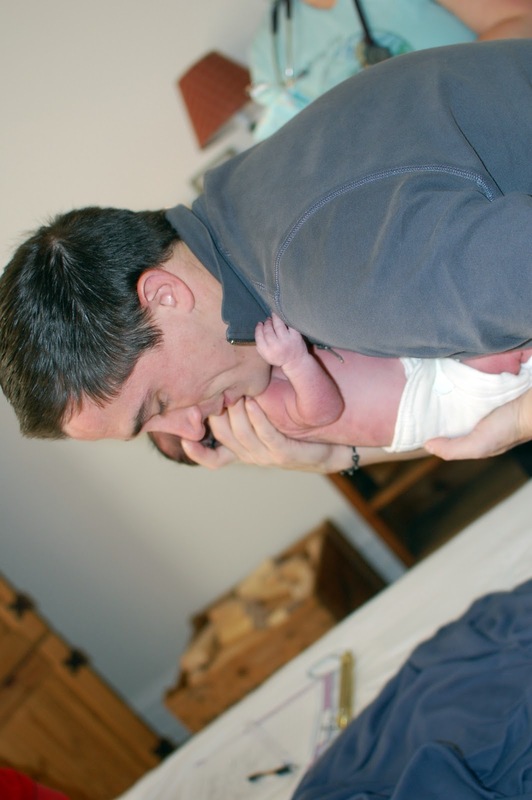 With other births, I don’t remember being as aware of the baby’s role as I was with this one. I began to think about the baby more and became more conscious of our ability to work together on this birth thing. Lori also arrived during this time, shortly after Khristeena, and began taking some pictures. Despite how well things were progressing, I was still feeling like things weren’t going fast enough for my taste and I wrestled with wanting to rush things too quickly. Much of that was due to the pain I was experiencing during contractions and much due to the length of time in between. During the contractions I was asking the baby out loud to hurry up and several times began pleading with the baby, “c’mon baby…please come out.” I kept thinking that they were too far apart (they weren’t but they weren’t as close as they might ‘normally’ be at this point) but because of their intensity, my mind was telling me that I would be in labor a lot longer and that didn’t sound at all pleasant. I didn’t have that same adrenaline this time and instead was feeling pretty tired. At one point in between contractions in the pool I laid my head down on the side and fell asleep for a moment. Brian woke me up and despite the fact that I wanted so badly to rest, he kept me going. We both knew that I wanted it over and to hold my baby and that falling asleep would slow things down. We realized that things were slowing down when I would sit or lay in the water so I stood and that helped keep things going. I could feel myself entering into the agony that is transition. Brian brought me juice and water and some cold washcloths, my comfort aids during the last birth. I would stand up to get a contraction going and as it would begin, I would rock and move around until I couldn’t stand it anymore and I would sink myself down into the hot water where I would complete the rest of the surge usually begging God for mercy or just saying His precious name over and over. Laying my head on a cold washcloth on the side of the pool felt so good at the end of each contraction. They are so much work and you feel exhausted when they are done. I went through several of these transition contractions wondering if I was getting close when I began feeling the pressure and the beginnings of a pushing urge. As much as I wanted to feel that, it was so very painful and crazy intense. I remember thinking to myself that there was no way I could do it, that I never wanted to do it again, and that I couldn’t believe I tell other women that this is possible. I remember Brian and Khristeena several times saying I was almost done but part of me was questioning whether I really was almost done. During this time, I heard some noise from the stairs and realized that John Paul had come quietly down to see what was happening. 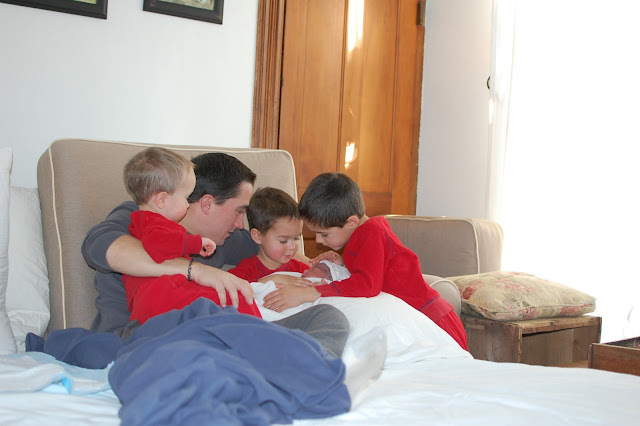 We had been unsure whether we were comfortable having the boys at the birth but decided that we would just see what happened. For all of my planning and need to nest and picture how things would go, that is one thing I don’t stress too much about and just leave up to God. John Paul had said a few weeks earlier that he wanted to see the baby born. I prepped him a small bit as to what to expect and what to do if he were present. Then I told him that if he woke up and heard us downstairs that he could come quietly down. All my others had been born during the night and I expected this one to happen the same way. So John Paul came down and Brian went over to see if he was all right and to settle him on the couch. A few minutes later, David followed and Lori was a huge help in quietly helping them stay over on the bed and watch. At this point, I was in a different world and had only the vaguest idea that they were even in the room. Michael also woke up and feeling a bit overwhelmed, stayed on the stairs behind the door. After a few more transition contractions, the urge to push got stronger again. I had decided before that I would try not to push hard with the contractions so as to attempt not to tear but I can’t really tell whether I followed that or not. I remember it being incredibly painful and then realized suddenly that I could feel the baby’s head ready to come out. Then I did push with them because I just wanted it to be over. I ended up propped up by the pool and in a semi-sitting position and felt my body push and the burning as the head began to emerge. I reached down and could feel my baby’s head, thank God! Lori reminded me at that point that I might want to try light pushing in between contractions to help ease the baby out slower and prevent a tear. I tried a little but I was so exhausted in between that my attempt at pushing in between was pretty feeble. I needed to wait until the next contraction when my body would do it for me. My body pushed hard during the next contraction and I felt the head coming out. I reached down after that contraction and could feel the head half way out and could feel a little ear! This was the first time that I didn’t push the head out in one big push and it was such a weird feeling having this moment of lucidity right at that moment and being able to feel with amazement this little head coming out! The next contraction came soon and the head came completely out. With a bit more effort at the next contraction, I pushed the sharp shoulders and the rest of my baby’s body slipped into my own hands. 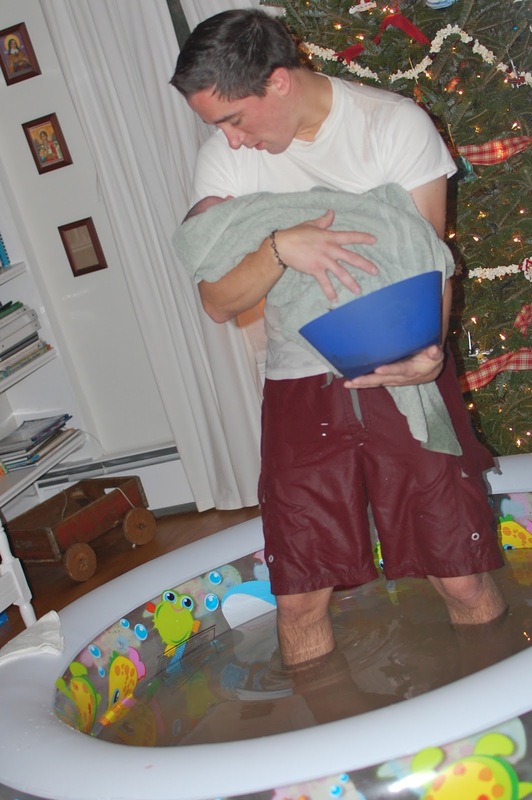 Brian assisted and we brought the baby out of the water to rest on my chest. It was hard to move but I was able to bring the baby to a comfortable position and checked to see…a beautiful little boy! I was thrilled and relieved and so happy to have another son! It was Luke Emmanuel and he was born at 7:05 a.m. on December 13 peacefully into the hands of the ones who had invited him into the world. He let out a small cry but was immediately calmed when he was in my arms. We covered him up with a blanket in the water and I rested in the water for a bit. It wasn’t until later in the pictures that I realized that John Paul and David had come over to the pool and were there when I was pushing out the baby! 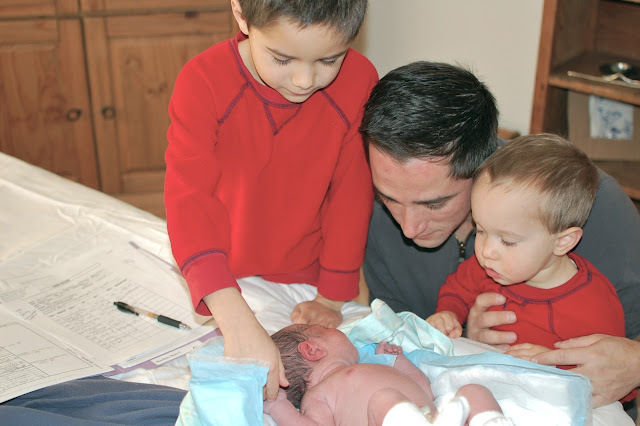 As soon as the baby was out and Michael knew it, he bounded into the room as well and all three boys were in awe of the new baby brother Mama was holding in the pool. It was amazing to see their reactions and has been pretty awesome to talk with them afterwards about what happened. The older two had been sure it was a girl but David was right in guessing a boy and kept saying ‘baby a boy?’, ‘baby a boy?’ Yes, sweetie, it’s a baby boy! I was exhausted at this point and didn’t feel any contractions coming but after a little bit needed to feel more comfortable and knew that I needed to birth the placenta as well. I could feel the cord still coming out of me and also knew that I had a tear that would need some attention. I put the baby up to nurse and he latched on pretty quickly. It didn’t seem to cause any strong contractions so we decided I needed to stand up to help it along. Brian took Luke while I stood and tried to push a little on my own. It is so hard to push again after the main part of the birth is over! It takes so much energy when your body just feels like a limp rag. I managed to push and the placenta came out into the bowl and was complete. I got out of the pool at that point and went over to the bed to rest. I was able to lie for a little bit while we let baby Luke nurse and the boys continued to marvel. After the cord was completely done pulsing and pumping all the blood into the baby, Khristeena clamped and Brian cut the cord. I’ve become convinced waiting to cut the cord is one of the most critical things that can be done to give a baby optimal health both immediately and for their lifetime. Khristeena performed the newborn exam and he looked perfectly healthy. She weighed him and he weighed a healthy eight pounds and three ounces – a full pound and a quarter more than the others who had all weighed exactly six pounds 15 ounces. Must have been all that raw milk I was drinking! He was 22 inches long and his head was 14 inches around, by far my biggest baby yet! It also now made sense why it had taken me a few minutes longer to push him out than my others who had come out so quickly. He was nice and healthy and showed us while still in the pool that he wouldn’t have any of the symptoms of Hirschsprung’s that his big brother David had. He proceeded to fill his diaper many times in the next two days just to give us more assurance, praise God! A short while later we began making the phone calls to let loved ones know he was here. Khristeena and Lori both left by 10 a.m. or so after making sure we were set and everyone was taken care of. We were so blessed to have these two amazing women there to be with us and care for all of us during Luke’s birth. I had the name Luke in my mind from very early on in the pregnancy. It just felt right and was strengthened by the fact that he would most likely be born in Advent and the Gospel of Luke is so integral to the Christmas narrative. We had many ideas for his middle name. The one I was most leaning toward while pregnant was Fulton. I felt drawn to Fulton Sheen for a few months and found out that he had died on December 9, which also means that if he is canonized his feast day will likely be on that day. If the birth had happened on the eighth or ninth, that would most likely have been his middle name. But a few days before his birth, the name Emmanuel popped into my head and felt so right. When we were at Mass a few days before his birth it was confirmed by the readings, songs and interior knowing that this was a fitting and good name for our baby if he happened to be a boy. Other names we had discerned were Raphael (definitely one of my top) and Gabriel. For girls we had Lucy and Mary or possibly some derivative of Mary. I feel so incredibly blessed to have been given another precious little son to cherish. I pray that I can be the mother that my little Luke deserves. He has been such a content and sweet baby and Brian and I cannot stop looking at him and being awed by the miracle that he is. I am so blessed to have had such uncomplicated births and am so grateful for the ability to birth at home in an environment of peace and complete respect for both me and baby. I love that the baby is treated with the utmost dignity as if they are really and truly a person who must be cherished and they are not forced through unnecessary trauma or pain. To me it is part of building up a culture of life - a culture that views birth as beautiful and holy and designed by the Creator and that treats even the smallest and weakest with the utmost dignity. At home, my decisions are respected and my role as a mother is reinforced. I do not have to fight to have the sacredness of the moment respected and I can choose to labor and birth my own child with the comfort measures I need and without unnecessary interventions that may be dangerous to me or my baby. I am so very grateful that I was able to give Luke this and that his birth was surrounded by love. I feel so indescribably blessed to have been given the gift of another son and have the privilege of being this precious baby's mother. Ugh, i just love reading your birth stories! They are just so interesting and it is fun to compare notes with my own l & d's. Haha, I too get more nervous and anxious with each baby I have,. The first thought I have now when I find out I'm pregnant is, "no, i dont want to go thru labor and delivery again!". I guess thats the crux of laboring naturally and w/o any meds, tho I wouldnt have it any other way. Is it weird that I noticed in your pics that there is a basket with books perfectly lined up in them? Haha. Thanks for sharing Mary. I know it was terribly hard but awesomely wonderful at the same time. What a relief it is to have labor and delivery behind us and a healthy baby (or two ;) in our arms! P.s. i noticed Brian always wears thosecred shorts for l&d. Must be his unofficial scrubs ;). Love the pics! Cant beat laboring in front of a lovely lighted Christmas tree! Thanks for sharing Mary! I loved hearing all about it, and the atmosphere looked so peaceful and beautiful!